Cast: Arjun Rampal, Sonu Sood, Harshvardhan Rane, Gurmeet Choudhary, Luv Sinha, Siddhanth Kapoor, Sonal Chauhan, Esha Gupta and others. JP Dutta's latest drama 'Paltan' completes his war trilogy post Border (1997) and LOC Kargil (2003), which is a great feat for any Bollywood filmmaker. Unfortunately, the veteran filmmaker who wrote, directed, and produced this movie did none of these jobs well. Based on 1967 Nathu La and Cho La clashes along the Sikkim border after 1962 Sino-Indian War, the multi starrer drama is overlong and has neither novelty nor freshness to it. 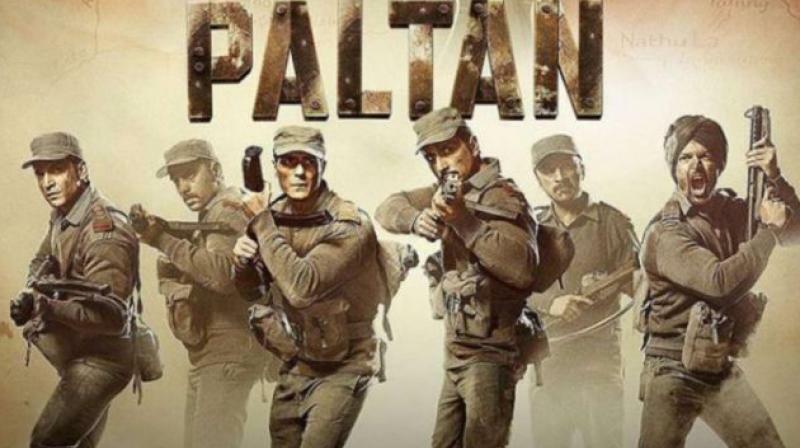 Paltan tells a story of bravehearts from Indian Army’s Rajput battalion, who put up a courageous defense against their unreasonable Chinese counterpart in 1965. Paltan is a story of pure sacrifice, patriotism, courage and lots of bullets and blood but sadly the film fails to hold neatly all of that together. The film could have been a very well made drama on how this 1967 war was fought against Chinese; it had the locations, the budget, and the skill to have been an engaging war drama. Instead it comes across as a bloated, almost 3 hour long bore of trying to meld the war moves with the quintessential masala movie. In a gut-wrenching sequence at the beginning of the film, we see a postman delivering tragic news about soldiers to their families at the break of dawn. The scene hits you with the trauma of these families that can only be imagined. However, post that the film turns to a collection of clichés. Here the war scenes are terribly executed, using the same repetitive scenes, and spending unnecessary time on casual talk. Next, there is no story nor any subplots nor any satisfaction of seeing any objectives achieved by the soldiers. Director JP Dutta gives his best to lend authenticity by using the real terrain but after an hour of the movie it is like deja vu. The inconsistent accents of certain actors, dialogues damage the theme and reduce the content to a mere children’s play. The director along with editor could sure have used a few lessons in pacing, notably around the totally extraneous character development scenes where we have it reinforced beyond any doubt that life of a solider is extremely fragile. The movie had the potential to send a strong message about the war, but the director got too bogged down with flaunting the cast, so much of the seriousness of the movie becomes lost. Also, why do they always have to use that slow-motion death sequence routine again and again? It is not touching. It is plain tacky. On the acting front, Harshvardhan Rane is best of the lot. His character is the only well-written one and the young actor nails it with impressive confidence. Luv Sinha and Monica Gil shine in their interesting little parts. Besides that, the characters are varied but every single one is some form of caricature which is devoid of any real personality; therefore there is hardly a foreground for others to perform. The rest of the cast including Jackie Shroff, Arjun Rampal, Sonu Sood, Gurmeet Choudhary, Siddhanth Kapoor, and all the ladies are there just to throw their generic lines in the lamest manner. The script tries really hard for substance, by reflecting on the character's thoughts, and predicament, but the dialogues feel forced and sadly corny. Overall though, this film can be quite enjoyable if not taking seriously and is instead treated like the 80’s action flick. However, looking at today’s changed audience, Dutta has lost the chance of making a great film.